It was February 1864. The war had dragged on for nearly three years. And both sides were desperately concerned about one irreplaceable resource: manpower. And then came 1864. On the 24th of February, Congress passed a bill amending the 1863 Enrollment Act4 — and it had an extraordinary provision that created some extraordinary records. Now the records of the U.S. Colored Troops are records we should all know. But there was another set of records created because of that same section of the law. And at least a handful of records from that not-so-well-known group still exists today. Now think about that for a minute. And think about the kind of records that might require. • he himself was loyal during the War. A trifecta for descendants of slaves and slaveowners alike: proof of the master-slave relationship, proof of service and proof of loyalty. Now you know it would be too good to be true to have all of those records still existing today and readily available online. 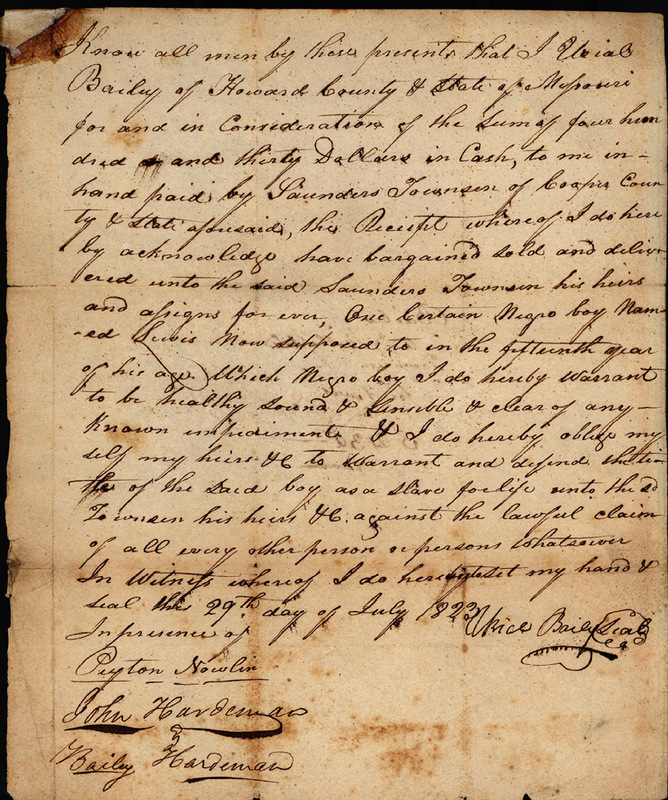 But at least a handful of individual records of claims by slaveowners are known to exist in the National Archives — and digital copies of many documents are available online. The records come from Missourians and, for some reason, ended up being held in the records of the U.S. District Court for District of Kansas in Topeka. And for the lucky few who find their family members in those records, they are wonderful resources. Just as one example, on 1 January 1867, Sanders Townsend of Cooper County, Missouri, filed a claim based on the enlistment of his slave Lewis into military service. 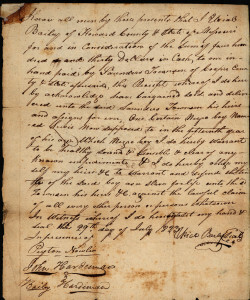 To provide his ownership of Lewis, he filed the bill of sale from Uriah Bailey, dated 29 July 1823, and giving Lewis’ age at the time as about 15. That’s the document you see here. The records are held in Record Group 21, Records of the District Courts of the United States, 1685 – 2009, and these particular documents are at the NARA regional facility in Kansas City. If you want to check them out, you can do a search at the National Archives’ website, Archives.gov, through the Online Public Access (OPA) catalog, and use the search term Slave Compensation Records. The digitized online records are right at the top. And, by the way, the fact that these records are online doesn’t mean there aren’t other similar records somewhere else in the National Archives. Using slavery as a search term at OPA produces 355 online holdings, 275 collection descriptions and so much more. Just as one example of other compensation records you’ll find there — check out the records of the District of Columbia Board of Commissioners for the Emancipation of Slaves, 1862–1863, in Record Group 217, Records of the Accounting Officers of the Department of the Treasury. Ah our dear dead! Yesterday, I met James Glasscock, the son-in-law of my Fluvanna County (VA) ancestor, Elizabeth P. (Winn)Woodson, and discovered he ended up in Ralls County, Missouri. This morning I worked on a chancery cause that the couple was involved in concerning distribution of slaves his wife inherited from her father. Those pieces not only add to the story but so does the 1863 description of James as “a truly loyal man” from the U.S. enlisting office–James, whose wife lost multiple cousins to the Confederate cause. I never know whether to think it is wonderful or creepy when things like this happen. Either way, I’m grateful for your blog and the knowledge you share with us! Oh excellent — glad you found these of use (even if you don’t much like ’em…). Thank you for this excellent summary. Some decades ago I ran into some related records, but did not make a note of them (thinking them not relevant to my folks) and have little idea where — not in Missouri-related records. I will keep poking at my brain in hope of retrieving something specific. Whenever a person joined the Army during the Civil War, physical characteristics of the person were recorded to aid in identifying the body if killed or to aid in apprehending if AWOL. But for the colored troops in this series of records, one additional fact was recorded — the name of the former owner. Note: these Slave Claims Commissions are totally separate from the much better known Southern Claims Commission.